The NCAA began sponsoring a championship tournament in Division I Women's Basketball in 1982. The sport has since exploded in popularity, and televised games draw millions of viewers. Women's basketball tends to be dominated by a handful of extremely talented teams. The style of play emphasizes team unity, and a truly great program features both a successful coach and talented players. 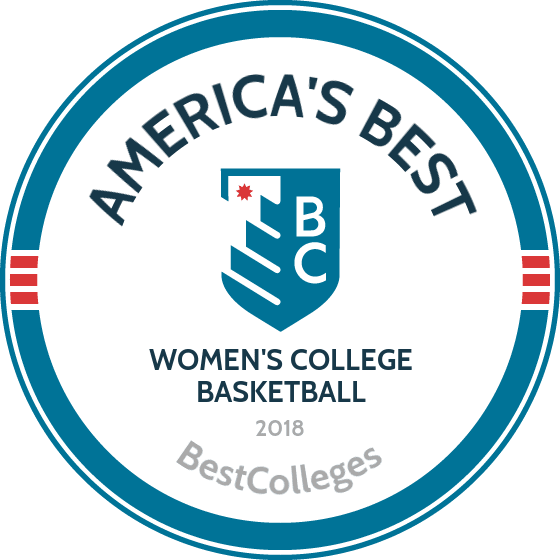 To that end, our ranking off the top women's basketball programs covers a couple of categories. These include recent WNBA Draft Lottery choices, as well as champions and runners-up since 1981. This approach allows us to acknowledge a program's historical success while prioritizing recent dominance. Our final ranking reflects the total points earned by each school, per our methodology above. UCONN has dominated college basketball recently, winning over 87% of their games under Head Coach Geno Auriemma (1985-current), who has posted a 918-134 record. The Huskies have won 10 national championships, more than any other women’s program. They have had six lottery players chosen in the past five WNBA drafts, and all-time Husky great Breanna Stewart is widely expected to be the No. 1 pick in the 2016 draft. Prior to UT’s meteoric rise, the Tennessee Lady Vols under Hall of Fame coach Pat Summitt were the queens of the hardwood. During her tenure (1974-2012), Summitt achieved almost unprecedented success, winning eight national championships and nearly 1,100 games. The Lady Vols have also appeared in all 34 NCAA Tournaments. Under head coach Muffet McGraw (1987-current), the Fighting Irish have made six Final Four appearances, finishing second in four of the past five seasons. McGraw won a title back in 2001 with NCAA Player of the Year Ruth Riley, who went on to have a successful WNBA career. In the past five seasons, Notre Dame has had six lottery picks, including 2015 WNBA Rookie of the Year Jewell Loyd, the top pick in the 2015 draft. The Cardinal, under Hall of Fame head coach Tara VanDerveer, have made eight NCAA Final Fours, winning two titles and finishing second twice. VanDerveer is one of a handful of women’s coaches to win 900 games, and she has an 801–166 (.828) record at Stanford. Recently, Stanford has had two No. 1 picks in the WNBA Lottery—Chiney Ogwumike in 2014 and her older sister Nnemkadi (Nneka) Ogwumike in 2012—both of whom went on to become WNBA Rookie of the Year. The Lady Techsters were the first dominant team of the NCAA era starting in 1982, making 10 NCAA Final Fours through 1999, winning two championships and finishing runner-up four other times under Hall of Fame Head Coach Leon Barmore. Louisiana Tech has an all-time 1043–264 record, and their .798 winning percentage ranks third all time. Current head coach Tyler Summitt is the son of legendary Tennessee Lady Vols basketball coach Pat Summitt. 2011-12 was a storybook season for the Lady Bears, as Head Coach Kim Mulkey’s squad became the first NCAA Basketball team, men’s or women’s, to go 40-0 en route to their second championship. Mulkey’s teams have earned 14 NCAA Tournament appearances in her 15 seasons, making at least the Sweet 16 in each of the past seven seasons. The Lady Bears owe much of their recent success to two outstanding players: guard Odyssey Sims, who was drafted second in 2014, and 6-foot-8 center Brittney Griner, who was drafted No. 1 overall in 2013. The Blue Devils have enjoyed two decades of sustained success, making the last 21 NCAA Tournaments. They were runners-up in 1999 and 2006 under former coach Gail Goestenkors, and under current Head Coach Joanne P. McCallie, Duke has achieved eight straight 20-win seasons. Duke has had four recent lottery picks: Elizabeth Williams, Chelsea Gray, Tricia Liston, and Jasmine Thomas. Gender-based college nicknames have a long and proud history, and USC’s “Women of Troy” may have the best nickname of all. Though they haven’t enjoyed much national success over the past decade, USC women’s program nonetheless boasts an impressive legacy. In 1976, USC became the first Division I school to offer scholarships for women’s basketball, and in 2007, they sold out the 10,258-seat Galen Center for a game against UCLA, the first time an NCAA women’s game officially sold out. Women’s Hall of Famer Cheryl Miller led USC to national championships in 1983 and 1984. The Cardinals made the Final Four in 2009 and 2013, finishing second both times. They have won 20 or more games in six of seven seasons under Head Coach Jeff Walz. Louisville plays in the KFC Yum! Center, which opened in 2010 and seats 22,090. In each of the last five seasons, the team has ranked in the top three in attendance, averaging over 9,000 fans per game. The Lady Terrapins played in the first NCAA final four in 1982 and have made four more since, including 2014 and 2015. They won the 2006 National Championship in current head coach Brenda Frese’s fourth season on the bench. As befits such a storied program, Maryland appeared in the first nationally broadcast women’s basketball game in 1975 (they lost to Immaculata College). Maryland has had nearly 20 players go on to play in the Olympics or professionally, including Alyssa Thomas and Tianna Hawkins. The Aggies have made 10 consecutive NCAA Tournament appearances under head coach Gary Blair, including their first national championship in 2011. Blair is the only male coach besides UConn’s Geno Auriemma to lead a women’s team to the championship since Leon Barmore’s 1988 Louisiana Tech squad. Center Kelsey Bone, the no. 5 pick in 2013, is one of several Aggies now playing in the WNBA, including Sydney Colson and Danielle Adams. The Tigers have been generally competitive throughout the NCAA era, making 18 tournament appearances between 1982 and 2009. The program’s heyday came in the late 1980s and early 1990s, when Auburn finished second in three straight seasons. Current Head Coach Terri Williams-Flournoy is in her fourth season, and she owns a winning record. The Boilermakers have made the Final Four three times and won a championship in 1999. Head Coach Sharon Versyp (2006-current) was herself a four-year starter at Purdue from 1985-1989, where she played in Purdue’s first NCAA Tournament appearance. Since then, the Boilermakers have only missed three NCAA Tournaments. Legendary Stanford coach Tara VanDerveer started began her impressive career at Ohio State, where she made the tournament three of the four years she coached in Columbus. In 1993, Ohio State lost in the championship game, but still had their best overall season. Third-year coach Kevin McGuff led the 2015 squad into the tournament’s second round after an uncharacteristic two-year absence. The Buckeyes have had three recent WNBA lottery picks, including Tayler Hill (No. 4 in 2013), Samantha Prahalis (No. 6 in 2012), and Jantel Lavender (No. 5 in 2011). The Lady Monarchs are one of the winningest programs in NCAA history, and won the 1985 championship under coach Marianne Stanley. Old Dominion appeared in 20 NCAA Tournaments between 1988 and 2008, missing only in 1991. The Lady Monarchs returned to the national championship game in 1997, only to lose to Tennessee. Like many women’s teams across the country, the Sooners started playing ball in the mid-1970s. By 1990, the program was in such dismal shape that Oklahoma announced they were shutting it down. A public outcry led the school to reconsider, and by the mid 1990s, the Sooners were again competitive. They’ve now made 16 straight NCAA Tournament appearances under Head Coach Sherri Coale, including back-to-back Final Fours in 2009 and 2010. The Sooners also produced Danielle Robinson, who was selected sixth in the 2011 WNBA draft. The Lady Bulldogs enjoyed a 20-year run of success under former coach Andy Landers, who won 862 games in his 36 seasons in Athens. They missed the NCAA Tournament in 2015, his last season, and he retired. Georgia’s best finish was in 1996, when they appeared in the title game, losing to Tennessee. The Musketeers are looking to return to their early-2000’s form, when they regularly appeared in the NCAA Tournament. More recently, Xavier had two lottery picks in the 2011 WNBA draft, Amber Harris and Ta'Shia Phillips. The Golden Bears have the misfortune of playing in the PAC-12 Conference, a league perennially dominated by their archrival, Stanford. Cal has enjoyed some success in the last decade, though. In 2007, they beat Stanford, ending the Cardinal’s 50-game conference win streak. California, under Head Coach Lindsay Gottlieb, has won at least 22 games in each of her four seasons. In the 2015 WNBA draft, star Brittany Boyd was the ninth pick. The Scarlet Knights enjoyed their best season in 2006-07, beating UConn in the Big East Tournament Championship game and reaching the national championship, which they lost to Tennessee. The Scarlet Knights are coached by one of the best, C. Vivian Stringer, who has posted a combined 952-351 record at three schools. The Spartans are led by Head Coach Suzy Merchant, under whom they have reached the NCAA Tournament in six of her eight seasons. Their best season came in 2004-5 when they reached the national championship game, losing to Baylor. The Longhorns are another historically great program, boasting a 957–356 record since Texas began offering the sport. They have missed only five NCAA Tournaments, achieving their greatest successes under coach Jody Conradt, who won 25 games 14 seasons in a row. Texas won the 1986 National Championship, beating USC to cap an undefeated 34-0 season. The Tar Heels have appeared in all but seven NCAA Tournaments. Their greatest success came in their 32–2 1993-94 season under Head Coach Sylvia Hatchell, which culminated in a national championship. Coach Hatchell is seeking her 700th win at Carolina this season. The Lady Raiders won the 1993 National Championship with superstar Sheryl Swoopes, who became the first player to sign a WNBA contract when the league formed in 1997. She then helped the Houston Comets capture four-straight WNBA championships. Former Lady Raider player Candi Whitaker is the current Head Coach. The Wildcats, under ninth-year coach Matthew Mitchell, have become a solid program. They are coming off their sixth-straight 20-win season, each of which featured an NCAA Tournament appearance. The Yellow Jackets have made the NCAA Tournament seven of the past 12 seasons under Head Coach MaChelle Joseph. Georgia Tech stars Alex Montgomery and Sasha Goodlett were lottery picks in 2011 and 2012, respectively.